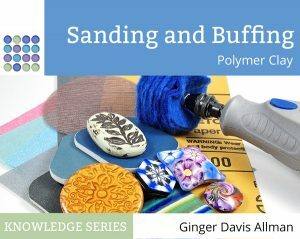 Have you ever wanted to mail polymer clay canes, but weren’t sure how to protect them against damage? Bubble wrap mailers aren’t ideal because canes can easily be mashed and dented. For best results, you need a solution that is rigid, crush-proof, and available in a range of diameters and lengths for canes of all sizes. And if you mail very many canes, you will want a solution that is low cost and readily available. I’ve searched for a polymer clay cane mailer before and came up with suggestions that were quite expensive. Recently, I received a package from Ed Street that included two pieces of this fantastic swallowtail butterfly cane. I was really surprised to see how he had packaged the canes. Each cane was wrapped in plastic wrap and then inserted into a short length of PVC pipe. Ed said that he uses a pair of pipe-cutting pliers to easily cut each piece to the exact length needed. You can buy PVC pipe in most hardware stores in several diameters. I like that this solution works well for both square and round canes. It’s a low-cost solution as well. At my local Home Depot, a 10ft piece of PVC pipe costs just $2.65. That works out to about 40 little cane mailers, coming to a whopping 6.6 cents each. Of course it’s a utilitarian solution and has sort of a…well…industrial-tech vibe going on. That might not match your shop’s branding. But Ed points out that you can easily paint the tubes with spray paint. You can also remove the printing with some sandpaper if you’d like. It’s also a great opportunity to apply a label with your shop’s information. But regardless, you have to admit that this is a great, functional solution to finding a polymer clay cane mailer. Thanks to Ed for both the great idea and for the really gorgeous cane pieces. Stunning canes! Thanks for the tip my friend. I am getting a set of these canes from Toni and Ed on Monday! Love this idea for shipping canes. I need to remember this tip. Then you’ll have your own little set of pipes just like mine, LOL. You’ll love this cane…it’s nice to get a butterfly cane, they’re useful in so many ways. If the pieces are long enough, yes. PVC has so many uses in a craft room for sure! Prescription pill bottles are an excellent way to ship canes as well. They’re limited in length, of course, but for most people they’ll work just fine. Sounds like you’ve found your use for all your bottles! Now that makes a brilliant idea even more brilliant! This is how I mailed a beaded necklace to a friend once. I wasn’t sure how some of the glass beads would hold up in the bubble mailer since several arrived shattered when they came to me despite being in a bubble mailer. Worked like a charm for that too! Love the idea of a business sticker or paint to give it a nicer look for when you sell items. Very smart idea for those who ship canes! Thanks for the tip! Ed and Tony (who made the cane) are recent members of the guild I belong to – the Greater Atlanta Polymer Guild. Tony’s technically expertise is amazing and Ed has lots of other great ideas! We are fortunate to have them in our guild! Actually, Ed made the cane himself (with Toni’s wise guidance). He’s been busy learning everything he can from Toni. Both are extremely knowledgeable and you’re lucky to have them in your guild! Shipping a chunk of unbaked cane is an excellent idea and can be useful to so many people. 2016 is a perfect year for it to come up into conversations because everything is so volatile and we need to think in terms of how we can communicate useful information without sparking unnecessary controversy that comes with wealth and big-box store names. We can say hardware stores, vinyl pipes or tubing, and empty pill bottles. Just think of alternative wording that doesn’t raise the hackles on someone’s neck. No more store names! Use imagery that brings us joy. I picture Ginger and she brings me Joy! You know to go a step further it might be neat to also cut pvc pipe to be able to stand canes up right in your storage system to be able to view easily and not fall over one another. I find it hard to get a good systeym for storing the canes. Just a thought. Thank you Marlene, excellent suggestion! Thanks for posting! You are the “Smart” one…love it. I am just starting out making clay buttons and would really like to be able to order canes from someone… any help is appreciated. Hi Diana, you can buy canes from the sellers on Etsy. I recommend IKandiClay, Clay by Kerm, Tami Shvat, and Ronit Golan. You can also buy the butterfly cane pictured in the article from Ed Street. First what size is the PVC pipe that you buy….next the plastic pill bottles are they safe for raw polymer clay? You’d buy whatever size pipe that your canes would fit inside of. Different sized canes would use different sized pipes. And pill bottles are usually made from #5 PP, or polypropylene, which is clay safe. What you want to avoid is #6 PS, or polystyrene.